A treasure from the 1970s, Moosewood Cookbook: 40th Anniversary Edition by Mollie Katzen is an impressive reprinting of the original hand-written version. 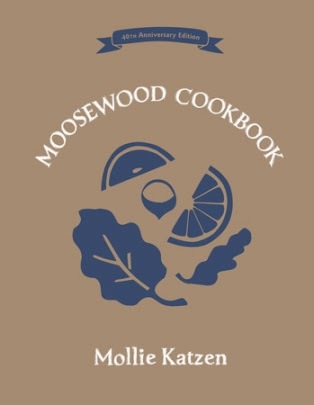 Featuring recipes from the Moosewood Restaurant, Mollie's book introduced cooks to a healthier variety of foods, including seasonal, whole grains, and vegetarian selections. Moosewood Cookbook retains the delight of the original, with Mollie's illustrations and neatly hand-printed text. Recipes include soups, salads, sandwiches, snacks, entrees, and desserts. With back-to-basics ingredients, Moosewood Cookbook offers an approach to cooking that gives cooks a basis for experimenting in the kitchen. The recipes are easy to follow, and though some of them are time-consuming, they are worth the effort and not difficult to put together. I appreciate that the preparation times for the recipes are given, and I've learned from experience that quicker isn't always better. Making time to savor and enjoy the process of preparing and enjoying a delicious and healthy meal can be therapeutic as well as nourishing. There's something for everyone in Moosewood Cookbook, and parents will find that many of the selections are kid friendly: vegetable kabobs, calzones, apple strudel, and samosas -- yum!